The Australian Rail Association continue to hold the ACT Governments ludicrous costing of light rail at $870 million to scrutiny. In todays Canberra Times the ARA indicate that Darwin are considering light rail at a cost of $17 million per kilometre. The full Canberra Times article can be read here. "The peak rail industry group says Darwin's Lord Mayor, Katrina Fong Lim is pushing for light rail in the Northern Territory with costs of $17 million per kilometre." The ARA says just like the ACT, land is available in the NT to accommodate light rail which helps keep project costs down. However, the ACT has still priced the potential 13 km light rail line at $66 million per kilometre, more than triple the estimates for Darwin. "The Northern Territory mayor's announcement means every state and territory in Australia except the ACT has seen the light when it comes to light rail." says Mr Nye. "One tram line can move 10,000 passengers an hour, while the same space dedicated to road moves only 800 cars or 140 bus services." "Our local Government should be learning from the experiences in other jurisdictions," says Mr Nye." “Sydney’s bus ways are creating parking lots throughout the city and after ripping up tram lines years ago, the city is now reinvesting in light rail to ease congestion. 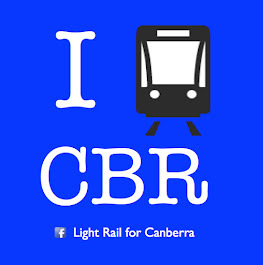 “Canberrans should be calling light rail as a long-term investment to improve the connectivity of the city,” concluded Mr Nye. I think we need to be careful when comparing costs. One of the Darwin alignments seems to be the old railway reserve along the Stuart Highway. In the same way, the extension to Dulwich Hill in Sydney is along a railway line. Gold Coast might be more comparable, as it uses a road.